Musketeers have been honoured by the USHL. The USHL has honoured a pair of former WHL coaches as it named Mark LeRose and Jay Varady as its general manager and head coach of the year, respectively. 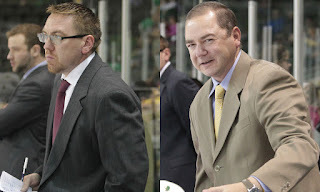 LeRose and Varady are in charge of the Sioux City Musketeers. . . . Voting was done by USHL general managers. . . . The Musketeers had the USHL’s best record (40-13-5-2) this season to win the Anderson Cup for the first time since 1985-86. The Musketeers surrendered only 125 goals in the regular season, the fewest in the USHL. . . . In the Western Conference, the Musketeers wound up three points ahead of the Waterloo Blackhawks. 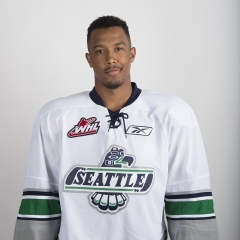 Sioux City also was six points ahead of the Chicago Steel, which led the Eastern Conference. . . . LeRose spent three seasons (2007-09, 2013-14) as an assistant coach with the WHL’s Everett Silvertips. Varady was with Everett for seven seasons, four (2003-07) as an assistant coach and the next three as associate coach. . . . The USHL news release is right here. . . . The Musketeers opened the playoffs last night, beating the visiting Des Moines Buccaneers, 4-1. Check out the tweet below for a tremendous assist from that game. At Regina, the Pats scored three times in a span of 4:41 and went on to a 3-2 victory over the Swift Current Broncos. . . . The Broncos still hold a 3-2 lead in the series with Game 6 tonight in Swift Current. .
. . 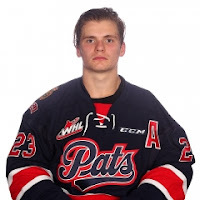 The Pats likely will be without speedy F Austin Wagner, who was hit with a kneeing major and game misconduct at 8:52 of the third period last night. 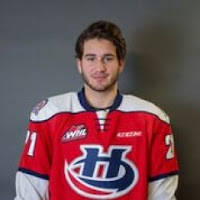 Wagner’s hit was on Broncos F Ryley Lindgren, who wasn’t injured. . . . "From watching it on the big screen, I thought there was shoulder contact," John Paddock, the Pats’ general manager and head coach, told Greg Harder of the Regina Leader-Post. “Maybe there was slight knee (contact) after but Lindgren is popping his head up and down like (he had) obviously drawn the penalty so it worked. He fooled them. He completely fooled them. He wasn’t hurt. You could see him out there playing net-front for the last three minutes (of the power play).” . . . Harder’s story is right here. . . . D Colby Sissons (4) gave the visitors a 1-0 lead, on a PP, at 17:16 of the first period. . . . Regina F Sam Steel (5) tied the score, on a PP, with 13.5 seconds left in the period. . . . D Connor Hobbs (3) put the Pats ahead at 3:49 of the second period and F Nick Henry (3) made it 3-1 at 4:27. . . . The Broncos got to within a goal when F Glenn Gawdin (5) scored, on a PP, at 13:18 of the third period. That goal came on the PP opportunity created when Wagner was hit with the kneeing major. . . . Steel and Henry added an assist each. . . . The Pats got 30 stops from G Tyler Brown. . . . 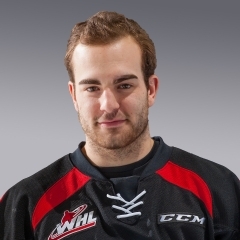 Swift Current G Jordan Papirny made 33 saves. . . . Papirny’s evening included a glove save off Regina F Braydon Buziak on a penalty shot at 8:52 of the third period. Regina was leading 3-1 at the time. . . . Swift Current was 2-6 on the PP; Regina was 1-4. . . . The Broncos lost F Lane Pederson when he left after a hit from Regina F Dawson Leedahl during the first period. Harder reported that Pederson “appeared to be woozy.” Broncos head coach Manny Viveiros told Harder: “Lane’s fine.” . . . Announced attendance: 6,484. . . . Darren Steinke, the Travellin’ Blogger, was at the game. His story is right here.